"For me, painting landscape truthfully is as much about touch as vision, as much about intuition and memory as conscious thought and decision. It requires intuitive, gestural and organic mark-making, reproducing the actions of nature, adjusting and re-adjusting to every previous mark, responding to colour relationships and ideas that have gone before in order to build up a constructed experiential landscape. Thus moments are layered, melting one into the next, just as a landscape is seen from a distance, approached, and ultimately consumed. These layered, transient, seen and felt moments, when transformed through the painting process, are intended to engender a prolonged engagement with the painting as a mediated experience of landscape. Mark-making is not depictive of landscape but like landscape: if the paint is metaphor, the marks are simile. 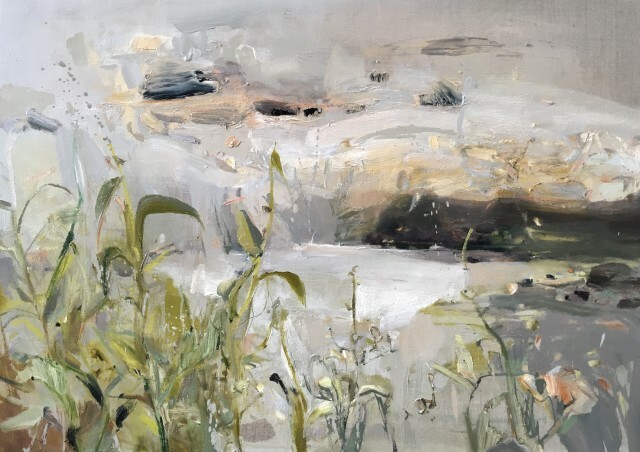 In the studio, rather than directly in front of the landscape, I can paint under the influence of the memory's interpretation of the living landscape - the 'soul-yearning' which is a response to more than what is manifest only to the eye." She is the architect of these landscapes. It is as if she fills up with the raw sensory, meteorological, and intangible details of the landscapes she visits, and later in the studio, refines, filters and purifies them. They are like plans, maps of a state of mind, or the correlative of a fleeting feeling. The results, though often highly abstracted, are powerfully emotional as well as intellectually controlled. They can ignite a yearning, awakening in us something which we recognize but cannot name. If they don't actually exist, then maybe they should. The resulting paintings balance between revelation and concealment, simultaneously opening out and then folding themselves away. Their power and authority comes from the way she combines the explicit and the ambiguous. They manage to be at once tumultuous and detached. These are proto-landscapes, or provisional landscapes - mutable and at some level unknowable. They map our twin needs for connection with, and escape from our surroundings and each other. Beth Fletcher has had successful exhibitions with us in 2013, 2014, 2016 and 2018. Beth will return with a major solo exhibition in August 2019.